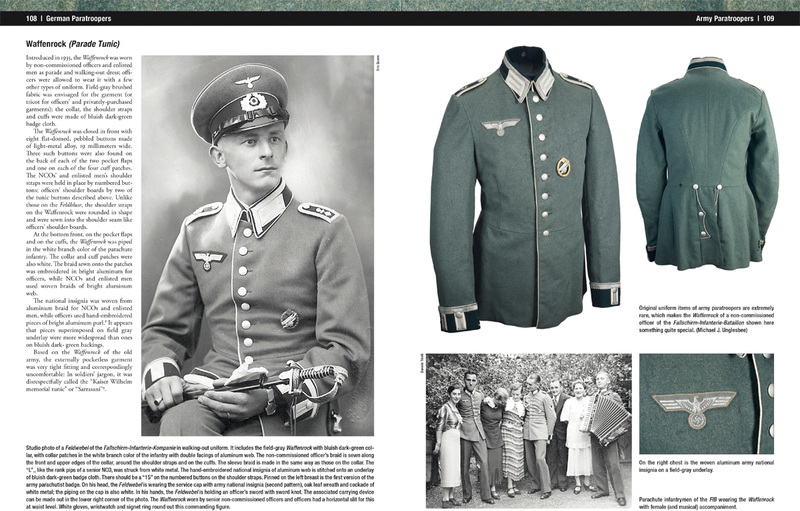 The books will be indispensable to collectors, uniform enthusiasts and military historians alike. 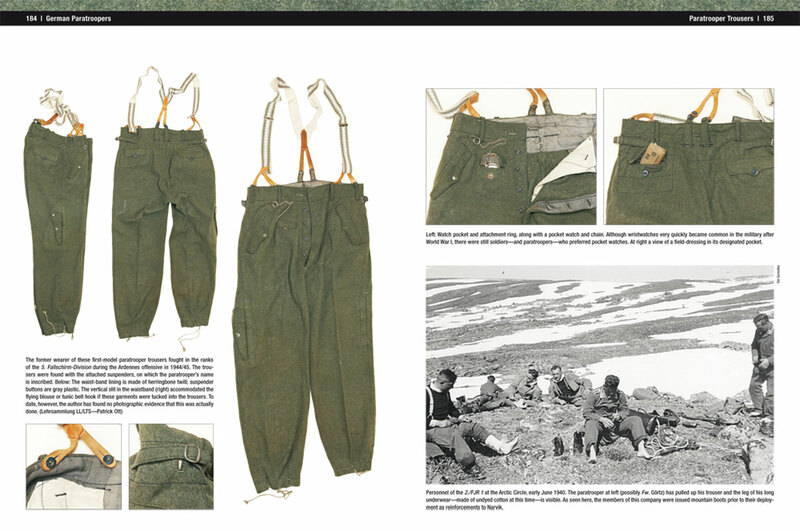 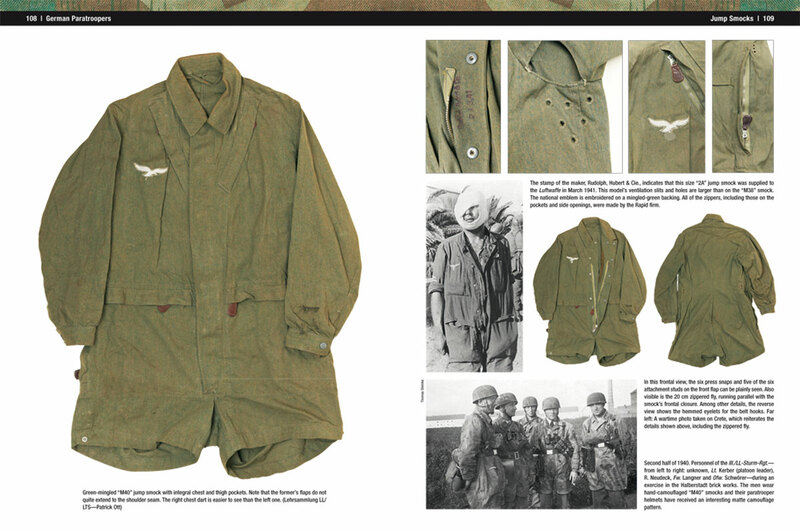 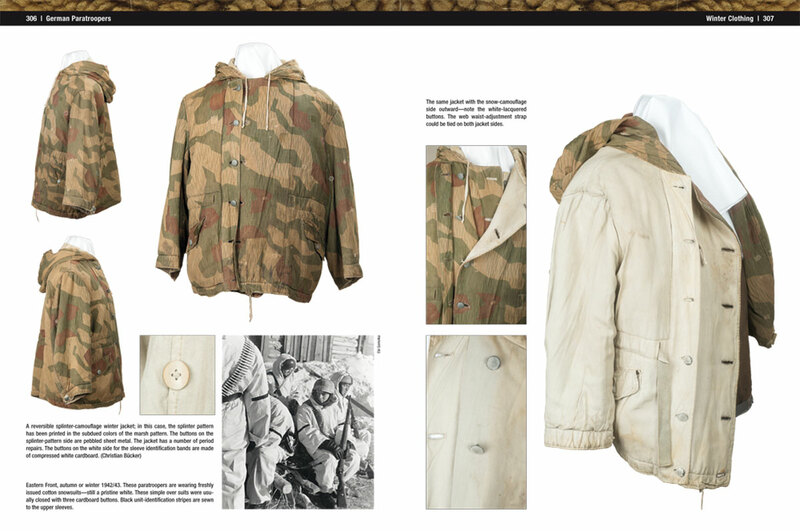 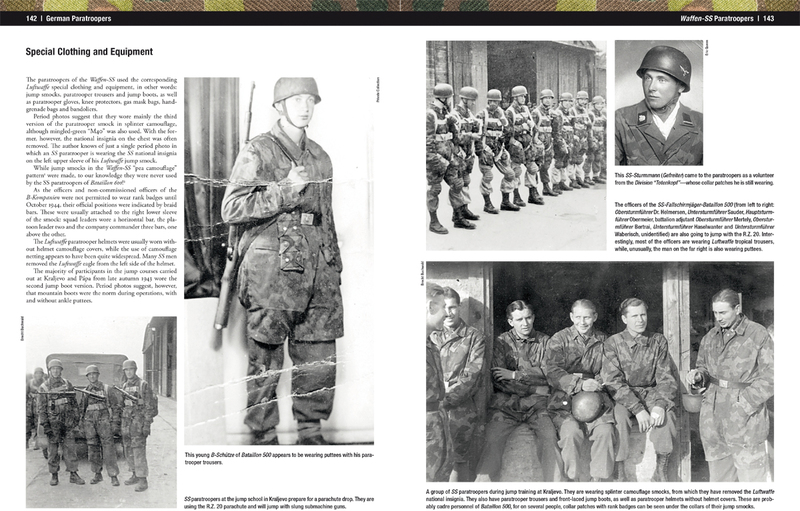 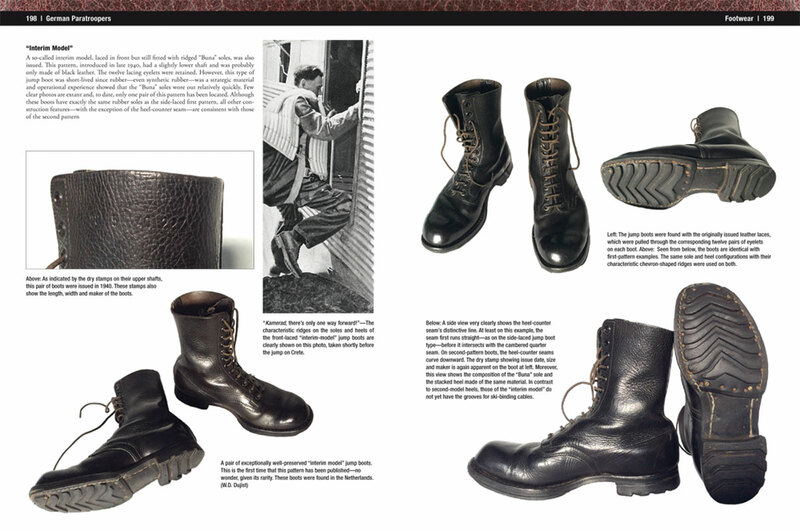 This three-volume work is the most comprehensive and detailed study of the World War II German paratrooper to date, providing in-depth examinations of nearly every uniform item—including all models of jump smocks—and equipment used from the airborne forces’ establishment in the mid-1930s to May 1945. 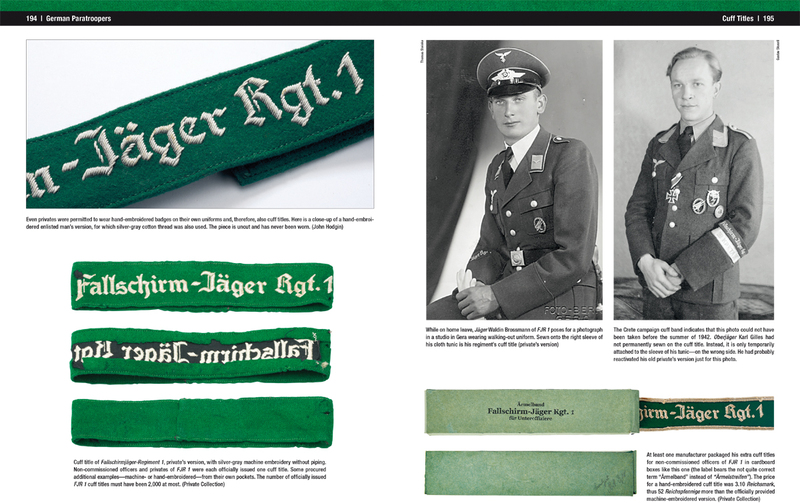 It also extensively covers specific insignia and various unique ephemera. 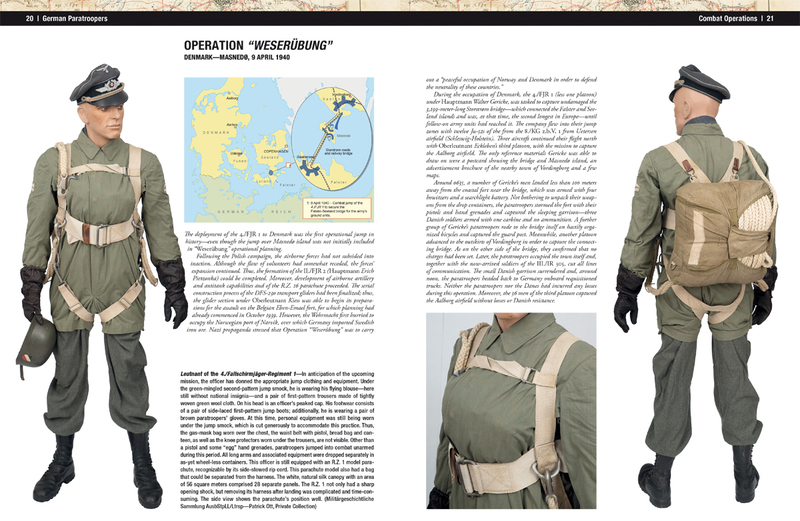 Finally, the work provides in-depth summaries of the operations the “Green Devils” fought in, from the air assaults on Norway, Belgium’s Fort Eben Emael, Holland and Crete, over ground combat in North Africa, Russia, Italy and Normandy through the Battle of the Bulge and on to the last days of the Third Reich. 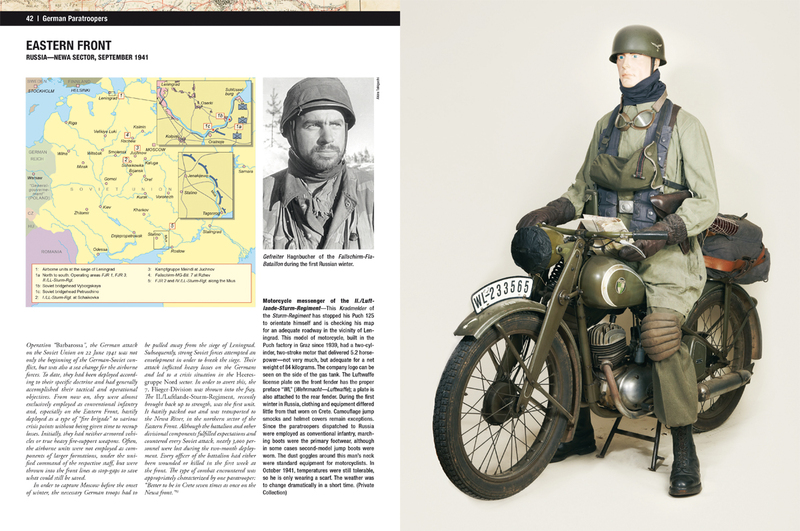 The author and publisher were able to draw on an unprecedented degree of cooperation with collectors and museums from all over the world. 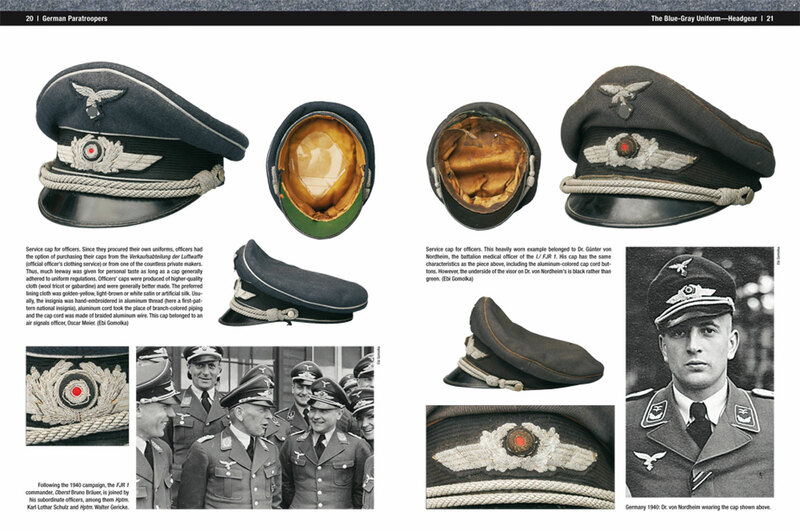 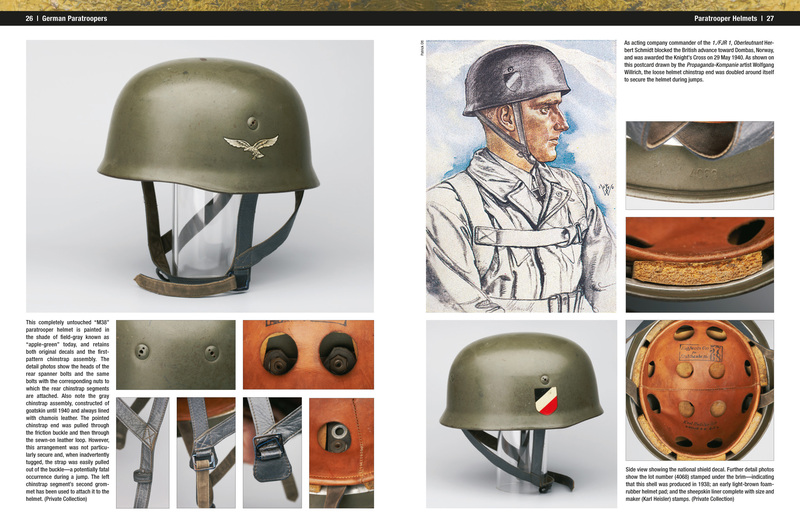 The three volumes run to more than 1,000 pages, with thousands of specially commissioned color photographs of original Fallschirmjäger artefacts, some of them never shown before, accompanied by many unique period black and white images, many of them hitherto unpublished. 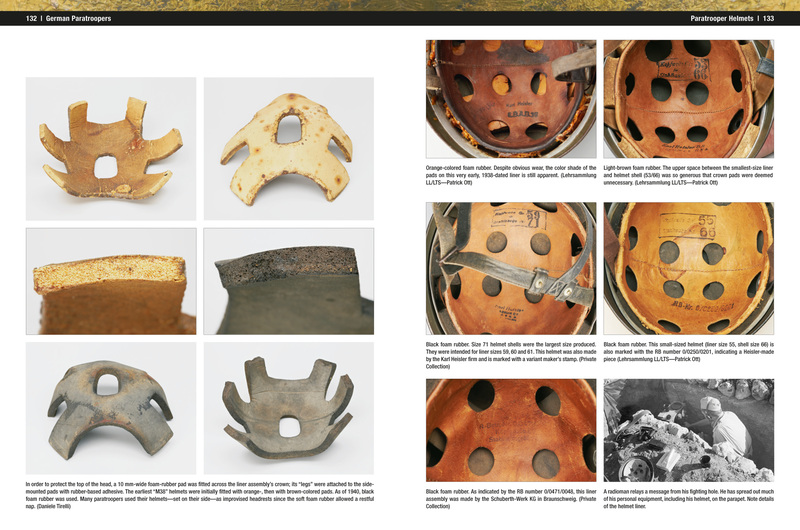 Click here for Volume 1 – Errata and Addenda. 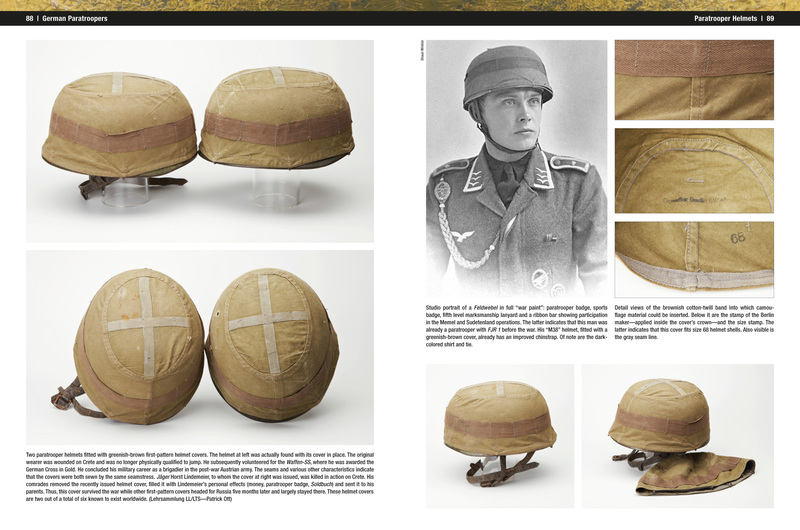 I just spoke to my publisher and was very thrilled to hear that both the English and the German edition of volume 2 have been printed now and should be available from dealers from mid-November. 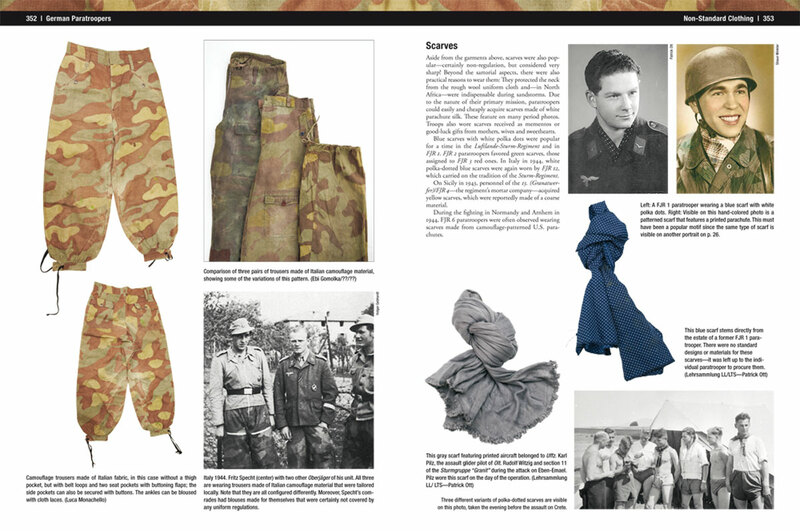 I hope to meet some of the forum members at the Kassel show in November, to finally put faces to the names. 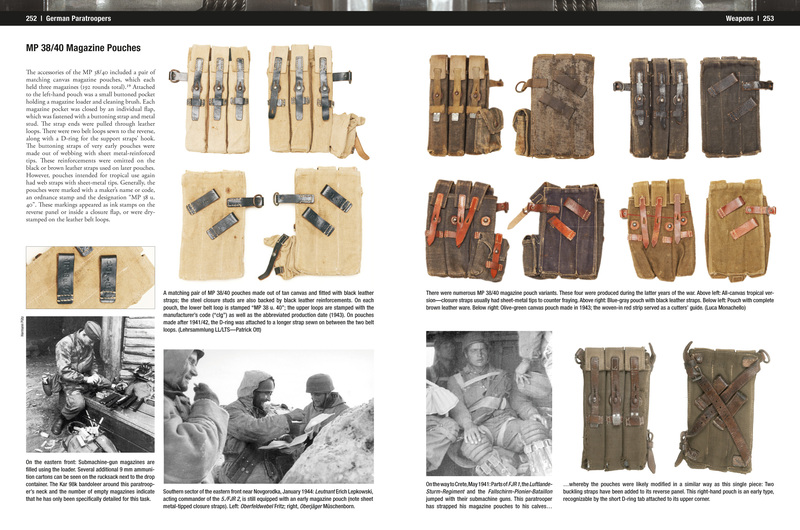 We’re still looking for interesting material for volume 3…. 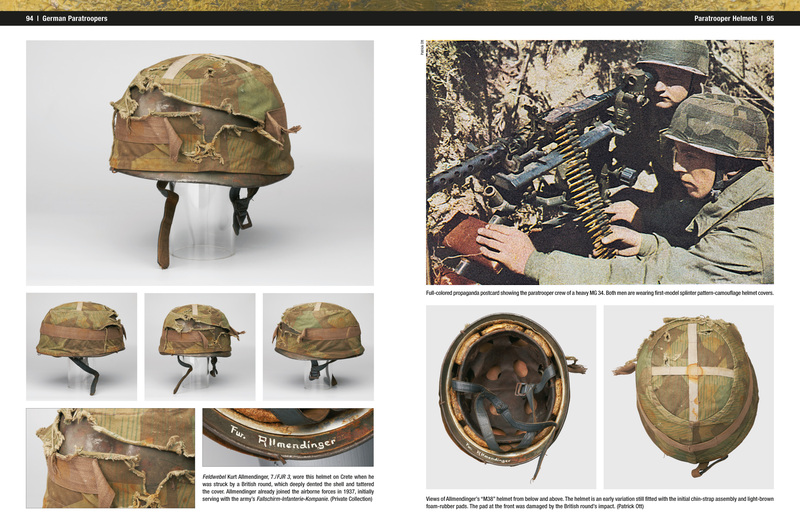 132 pages dedicated to helmets, 54 to special para equipment, 40 normal equipment, 52 on weapons, 40 on parachutes and, finally, another 32 on drop containers. 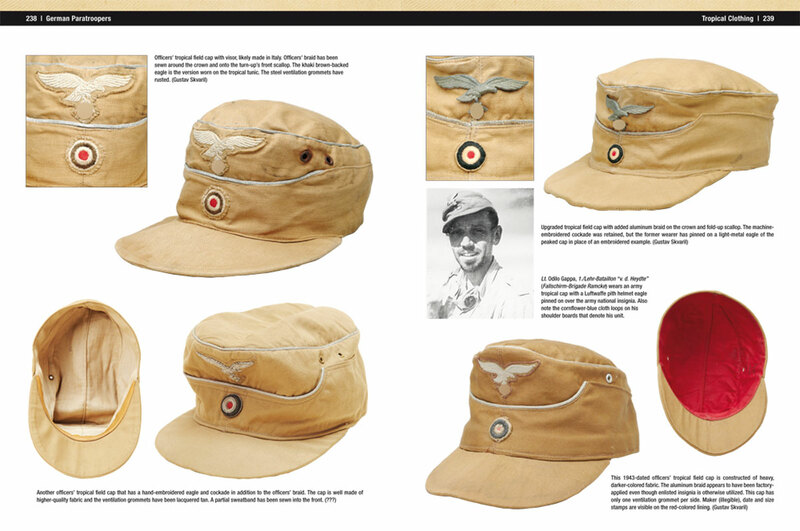 Click here for Volume 2 – Errata and Addenda. 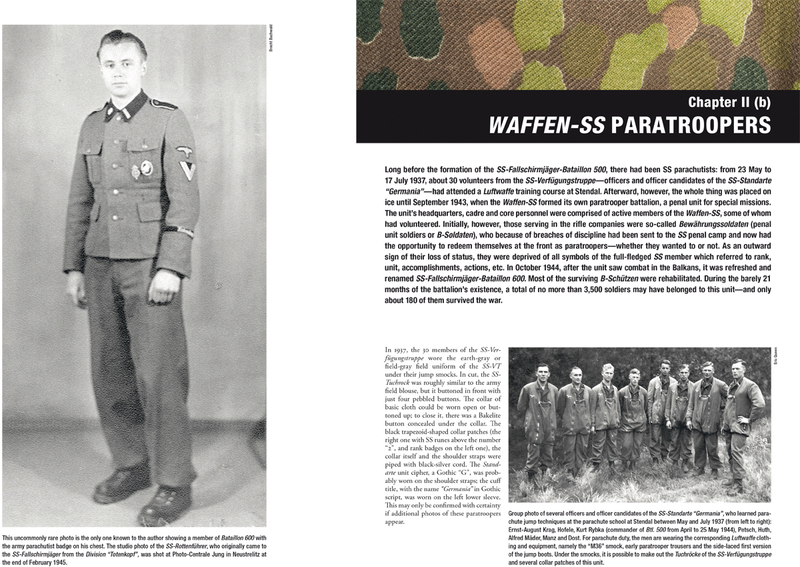 Initially, the operational history of the German airborne forces between 1936 and 1945 is summarized. 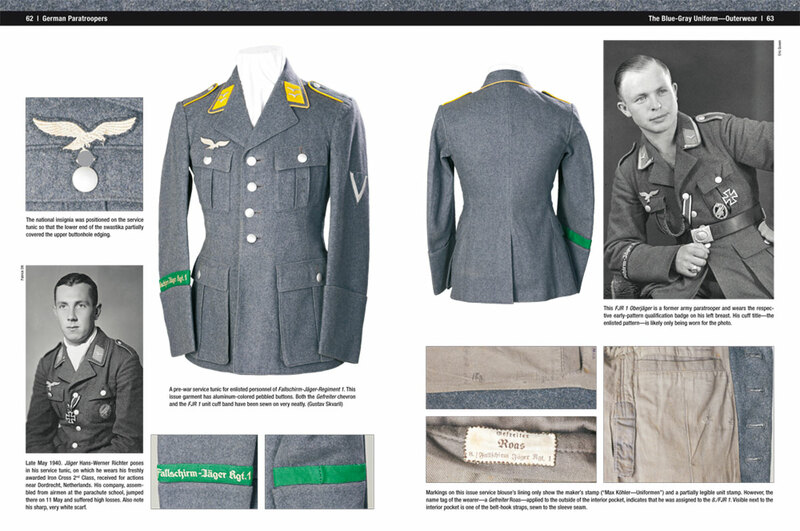 This section includes detailed views of more than 45 accurately uniformed mannequins, over half of which were specifically assembled for this project. 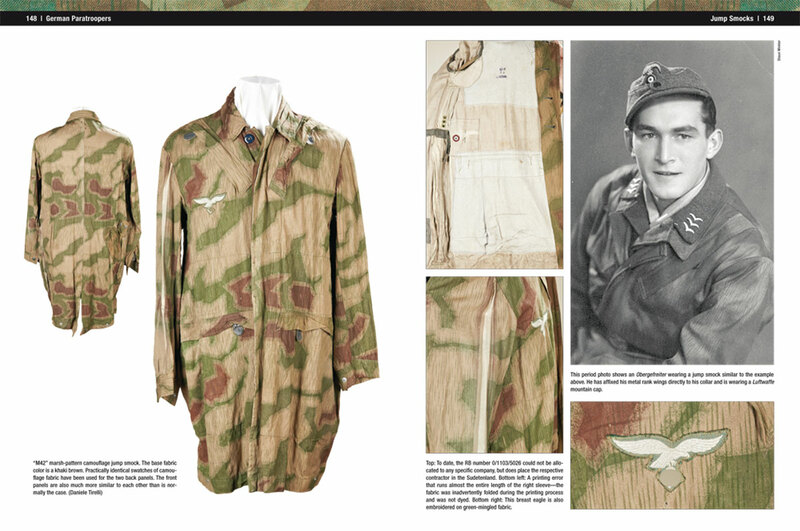 They illustrate the appearance of German paratroopers from their beginnings in Regiment “General Göring” through the unconditional surrender of the Wehrmacht in May 1945. 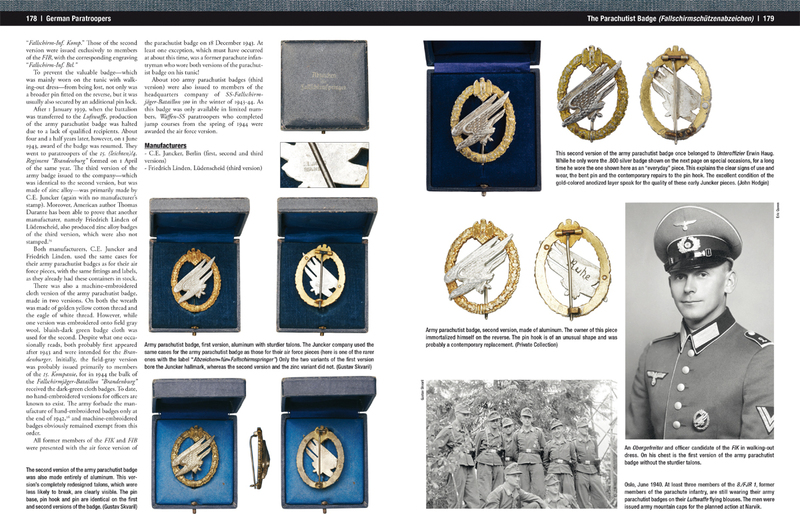 A further chapter devotes nearly 100 pages to specific qualification and formation insignia of the airborne forces– parachutist badges, cuff bands and specific unit insignia – as well as typical decorations and awards along with their award documents. 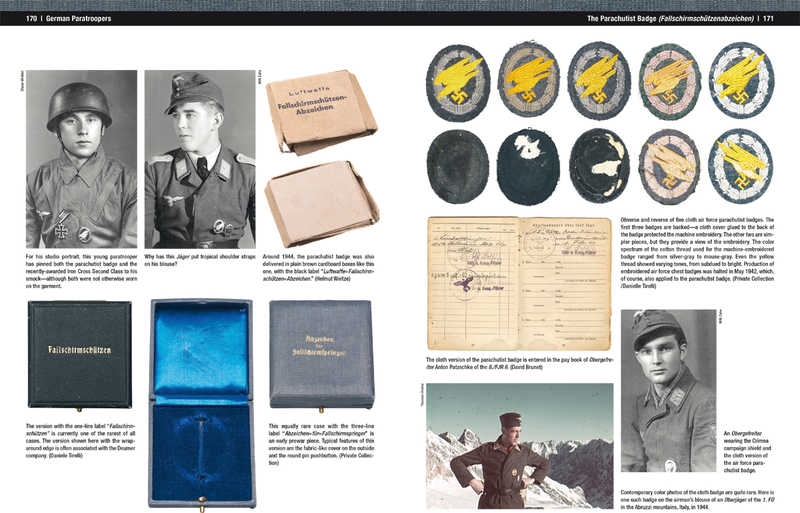 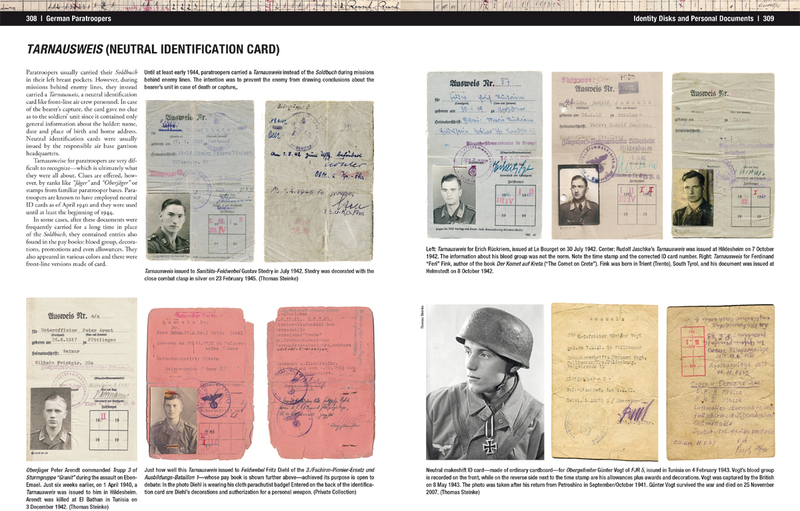 This volume also presents service record books (Wehrpässe) and pay books (Soldbücher), as well as other personal papers used by the Wehrmacht that were also utilized by personnel of the airborne forces. 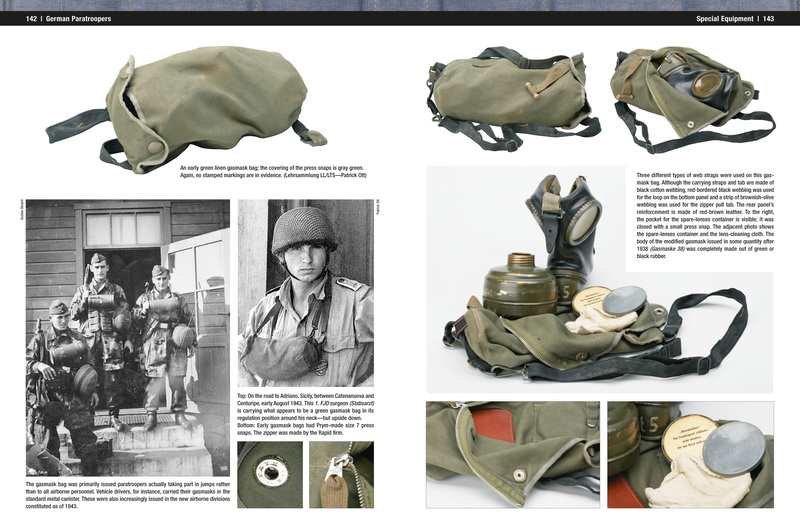 The chapter also includes a section that covers paratroopers’ ID discs in detail.